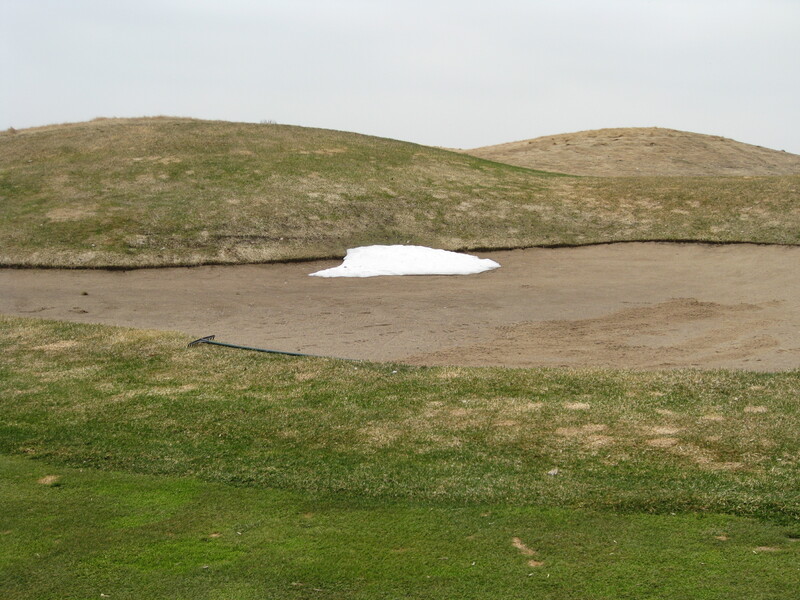 Overview: It was clear last weekend that there would be golf options available this weekend. 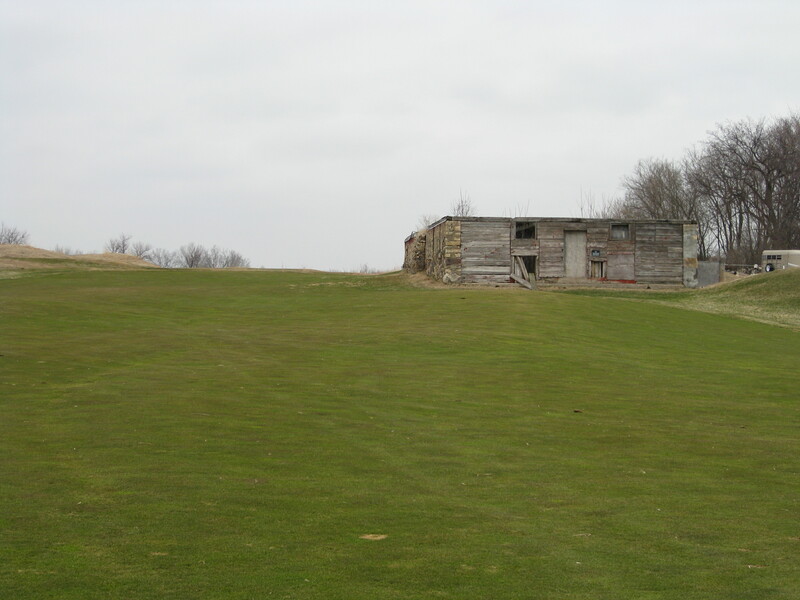 Certainly not every course would be open, but there would be a lot that would be welcoming golfers for their first Minnesota rounds of the year. So the question I had to ask myself as the organizer of this outing was: How do I avoid a muddy, messy golf experience. One thing I don’t really like is playing with constant mud balls. I don’t like squishy golf courses where every step leads to varying degrees of casual water. I don’t want to come home with mud all over my pants and my shoes as a total mess. So my strategy is simple: Choose new. And choose a course that isn’t completely tree lined. New courses often have much better drainage than older courses and courses where the wind blows a little bit tend to dry out quicker. 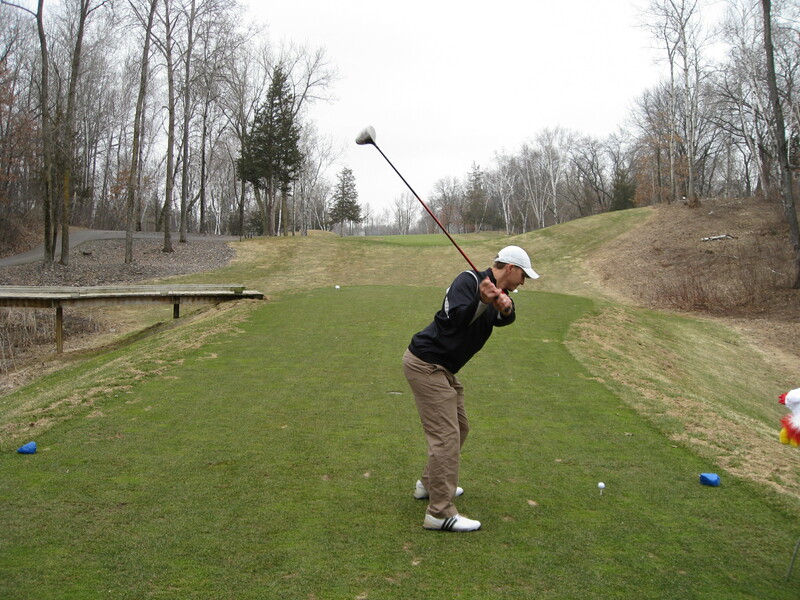 I played at Loggers Trail once previously as it was the site of my first Minnesota round of 2007 and I remember it being decent. Thoughts: Loggers Trail was a perfect choice for our group. Obviously the expectations for the first round of the year are much different than what you hope for later in the year. But I had no complaints or reservations about my time at Loggers Trail. I paid $38.57 to walk 18 holes and hit a small bucket of range balls at 9:30 on a Saturday morning, it certainly seemed like a fine value. Course conditions were certainly good enough. The course was dry and that was my big thing. 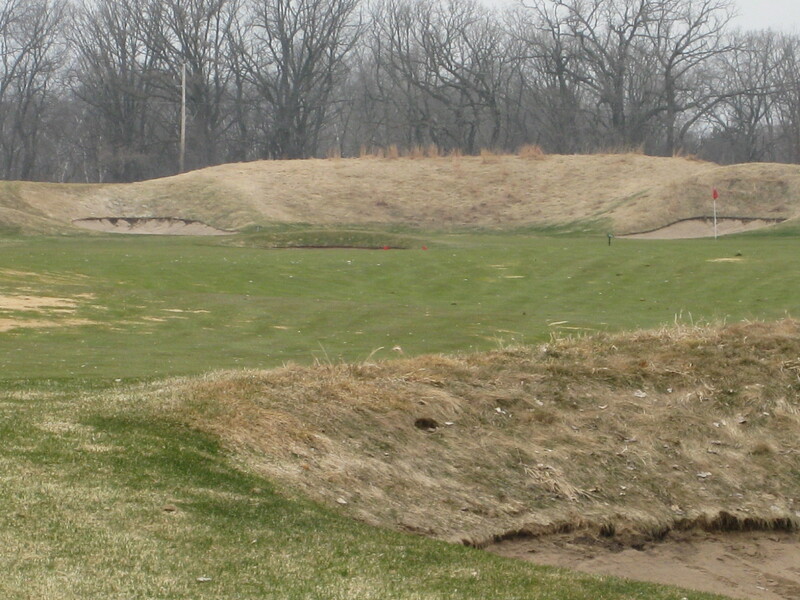 Some of the greens had some winter kill and were of an odd, bleached out color, but they putted well enough. It was a very pleasant morning. It wasn’t cold. There was enough wind so that you had to pay attention to what it would do to your ball, but there wasn’t too much. There are some hazards of early season golf in Minnesota. First a bunker and then a water hazard. 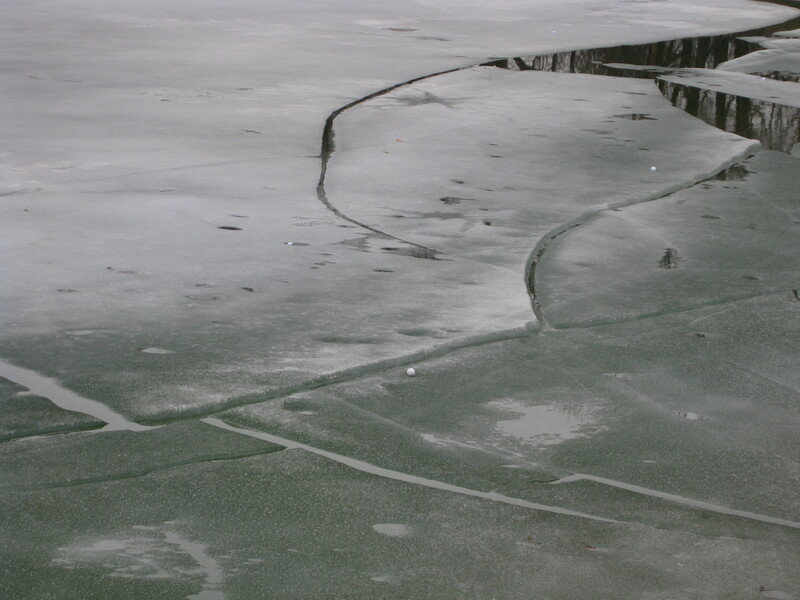 Yes, those are golf balls on top of the ice. No, none of them were mine nor did they belong to anyone in our group. Here’s the kind of tight tee shot on No. 4, one of the more difficult par 4s. Here is No. 7, maybe the most interesting hole on the course. At 334 yards, it probably isn’t a driver. I like the hole because if you hit it down the left side and draw it around the tree on the corner, you bring the water into play, but a good shot leaves you with a much better angle to the green. I, naturally, bailed and hit a hybrid down the right side. It was a super safe play, but I couldn’t see either the green or even the top of the flagstick. A cool hole. Here is a shot looking back at the No. 11 tee. That is what looks like the foundation of an old farm house. When you stand on the tee, you want to hit it over the corner of the house with a little draw. That leaves you with a much shorter shot into the long dogleg par 4 (470 from the back and 430 from the blues). Summary: We had a very nice morning at Loggers Trail. We walked 18 holes in a little less than four hours. We didn’t wait on a single shot and nobody waited on us. For early April, the golf course was in good shape and I can imagine the greens will roll a bit quicker even a month from now. There are a number of good/interesting holes, but there are some boring holes as well. The 12th hole (which was my only birdie of the day) seemed to be little more than a way to get from the 11th green to the 13th tee. The finish is particularly stout as 17 is a 223 par 3 from the blues and 18 is 422 yards. Both holes played into the wind on Saturday and, not surprisingly, I finished with a pair of bogeys. Our group had a good time. 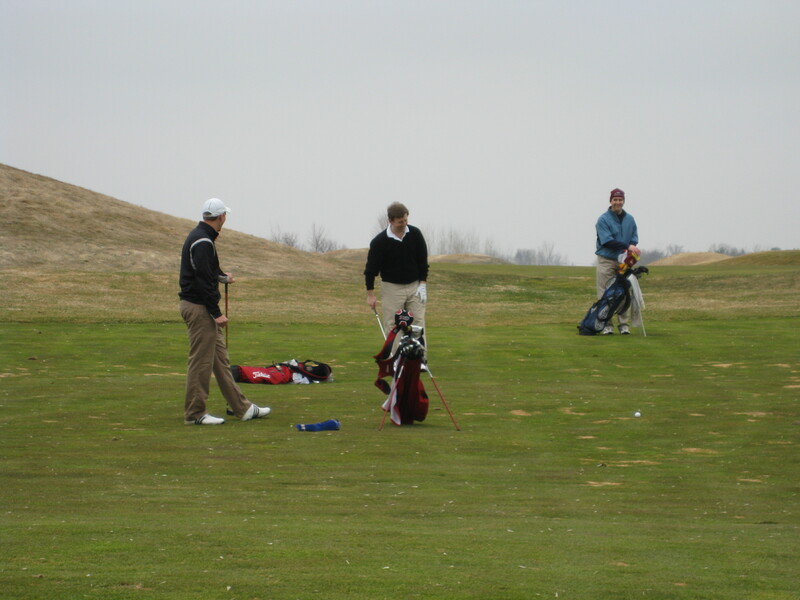 Everybody hit it pretty well for early season golf and we had four scores between 78 and 83. And in something of an upset, I finished the round with the same ball I started with. Would I play there again? It will certainly be on my list of good early season options moving forward and there is pretty good value there. 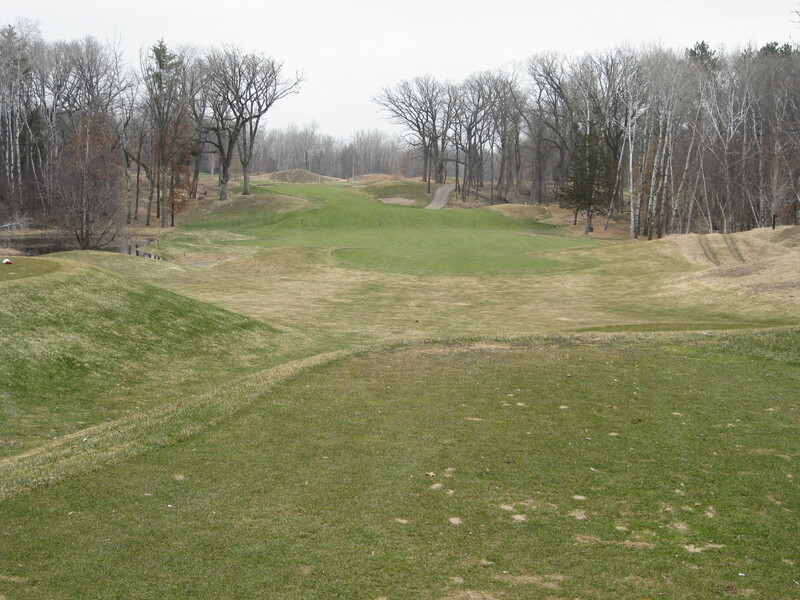 Now, to be honest, there are probably a dozen public courses in the Twin Cities I would rather play, but Loggers Trail is much cheaper of an option than almost all of those courses. If you live in the East Metro, it is worth a play. If you live in the 612, 763 or 952, it is a bit of a drive, but might be worth it. It was a fun round! Thanks again for setting it up. Thankfully I made some putts because if I hadn’t I would of been a little peeved with multiple double +’s! Did you talk about Sid Hartman all the way around this time, too?